The pictures show, first of all James, me, Malachy Tallack and Steven Laurenson outside The Famous Bein Inn in Glenfarg, and then James and me on Sunday night at the Woodlands Beanscene in Glasgow. I think the tour went well, on the whole. Many, many thanks to everyone who enabled: Sheila and Neil at Aberdeen MUSA, David at the Bein Inn, Sandy, Fiona, David and Mary at the Lang Spoon Festival, Tam and Simon at Beanscene. And thanks to all the friends, old and new (and some folk unseen for many years!) who came to the various gigs. At the moment, it looks like we'll be doing a week in Inverness in August, hosting (like last year) a series of special lunchtime events at Hootenannys. Apart from that, I'll be playing at Ayr Beanscene during the Burns Festival, on 24 May. Foodtastic Musa, The Beautiful Mountain and Jolene has a baby! The food at Aberdeen's Musa, where we played last night, is exceptional - lovely venison. Chef Jens, legendary for his work at the nearby Cafe 52, was on holiday but David did a fine job. Standing room only for the gig itself, numbers swelled by The Fortunate Sons, who were playing at The Tunnels. Apologies for not making it later on, guys - exhaustion after the boat trip set in fiercely. James and myself have become, briefly, regulars at The Beautiful Mountain in Belmont Street, which is expensive but truly exceptional for breakfast, coffee and snacks. Easily the best public porridge I have ever eaten. James is off to see the new movie The 300 while I do some broadcasting. Then it's off to Glenfarg for the Bein Inn gig. Meanwhile, hot news! Jolene Crawford of Finniston has had her baby, a bouncing girl called Bella. Not only that, mother and daughter are coming to the Lang Spoon Festival! That's commitment for you! Just off on the boat tonight (see yesterday's post!) to commence a wee musical tour with Big James on bass. Thursday will see us at Musa in Aberdeen, a lovely cafe/restaurant venue where we played last year with Joe West. 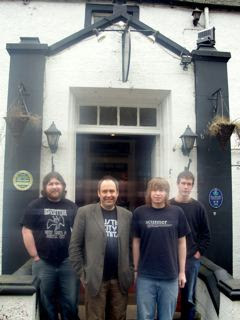 Friday we're at the legendary Famous Bein Inn in Glenfarg, and then Saturday at the Lang Spoon Festival in Glenrothes. Special mention for the Glenrothes, Rothes Hall gig: It features TM Show faves Finniston, The Lush Rollers and Malachy Tallack, and tickets have not been going that well (possibly because at the same time, in the next door Rothes Hall, Julie Fowlis, the Red Hot Chili Pipers and Boo Hewerdine are playing). So if you can get along, get along. Jolene Crawford from Finniston is due to have a baby that night, and you don;t want to upset her! Sunday we're at the Woodlands Beanscene in Glasgow. Are our ferries really safe? And is Bill Forsyth the greatest Scottish film maker? (1) Generally yes, but almost certainly not as safe as the battered old P&O ex-Baltic tubs that used to chug up and down between Shetland and Aberdeen in almost any conditions. My evidence? Simply this. When NorthLink cancel sailings, it's always 'the captain's decision'. Sometimes it's tidal conditions in what is rapidly becoming the useless harbour at Aberdeen (Rosyth or Invergordon, I don't care which, just change. As long as it's not Scrabster). But more and more often it's 'for the safety and comfort of passengers'. Now, conditions are NOT worse than they were back when you used to spend 36 hours on the St Sunniva or the St Clair, heartily wishing the captain did NOT have such confidence in his vessel. The fact is, the Hjaltland and the Hrossey are not able to handle extreme weather as well as the older boats. And I'm not making this up. One crew member I spoke to said the basic problem was that the boats had been 'very cheaply built' at a fraction of the budget set aside by P&O for new ships in their bid to the Scottish Executive to continue with the route. This, he opined, was the reason for a recent - and potentially catastrophic - watertight door failure. And so the captains, wisely knowing what their boats can handle, choose to stay in port when the going gets rough. It ain't comfort; it's safety and the NorthLink boats aren't considered as capable as the P&O ones. And that's a fact. Not to mention a disgrace. As for (2) I think so. Or neck and neck with Alexander MacKendrick (Sweet Smell of Success, Whisky Galore, The Maggie). I watched Gregory's Girl last night for the first time in 27 years, and it was truly, sweetly wonderful. It made me want to move to Cumbernauld. Or Cumbernauld as it once was, or was once dreamt of. It was full of surreal touches I'd forgotten - the magnificent Chic Murray, playing assembly hall piano; Jake D'arcy and Dee Hepburn's gloriously innocent football tactics dance in the dressing rooms; "How come you know all the best numbers?" No violence, no swearing, no threat, the strange wisdom of the children, the sheer innocence of it all. It's a lovely, lovely movie. And it made me wonder if I ought to watch the very late sequel, Gregory's Two Girls, again, in the hope that it might not be as horrendous as I thought it was the first time. Bill Forsyth's ouevre, if you can call it that (and why not?) contains some of the most consistently great work in Scottish filmology: That Sinking Feeling is a brilliant first feature, the class in handling a youthful ensemble cast heading straight to GG. then it's Comfort and Joy, best appreciated for its darkness rather than its comedy, before the two masterpieces, Local Hero ('we have an injured rabbit in the car')and the astounding, criminally underrated Being Human. Robin Williams at his best by a long way. I'm planning a wee trip to the Islay Festival, or Feis, at the end of May, and have been inveigled by my friend Dave to (a) cycle and (b) camp. I tried to interest my son Magnus in the expedition. He is, after all a grown student, with interests extending from real ale to computer games, and I'm sure he'd enjoy visiting various distilleries. There's also the fact that my maternal grandfather, John MacCalman, was born in Islay, leaving when he was 12 to begin work in industrial Scotland. I hope to investigate his/my background while I'm there. Magnus, however, point blank refuses to camp. He claims to have been put off for life by "a terrible experience at the Download Festival" where he couldn't sleep because of "a rock". As opposed to, hey! Raaaaawwwk! Promises of Thermarest sleeping mats, four-season sleeping bags and a decent tent have so far failed to prevail. Young people nowadays! Both James and Martha had Grade Five music exams yesterday, Martha's in cello, James's in double bass. I think they both did fine, though James, who has to be harangued into practising, breezed through it with serene self confidence, and Martha, who practises religiously (and not just on cello; traditional fiddle, piano and drums too)alas forgot one of her easiest scales. Never mind, she felt happy about the rest of her performance. I'm gradually learning to cope with the stresses and strains of sending weans off to do battle with performances over which you, as a parent, can have no control. Though watching and listening to Martha in last year's Shetland traditional fiddle contest was one of the most draining experiences of my life. 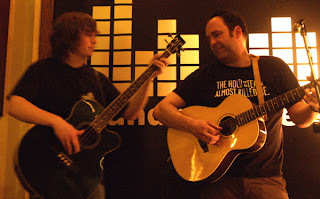 Now, James and I have to prepare for our own public appearances as the Tom Morton Two, and it's sair fingers and much practising before our first gig on Sunday. I'm asking myself, why? I'm 51, and the idea of going on the road, albeit just for four days, and putting myself through the adrenalin storm of live performance again is making my heart quake and my throat constrict. I know, being on the radio ought to be a tense affair, but after five years of this show and 20 of broadcasting generally, the nerves, though still there, are buried down deep, only emerging when things go badly wrong. It's only when you stop doing it for any length of time that you feel this weird absence, this lack. And you realise that you've become both addicted and innured (but not immune) to the bizarre business that is live broadcasting. Phew! I don't know what kind of whisky I was drinking last night at Maurice's 60th birthday party at the Ollaberry Hall, but it was very good. I don't even have a hangover and managed to accomplish an almost injury-free Boston Two-Step into the bargain. Well, I wasn't injured. Other people may have been. Probably the best buffet I have ever seen or partaken of in my life, too. Yum. Actually, I think it was Famous Grouse. Brand new whisky musings over at Nippy Sweeties, by the way. Northernmost. I love that word. And, fortunately, so do the news editors of publications throughout the world. At least, they used to. Back in the 1980s, in my brief career running Shetland's news agency, I would flog all kinds of 'northernmost' stories: The UK's most northerly....you name it. Postman, postwoman, traffic warden, school, fire station...all worth money in lineage to a desperate hack. The tale of the UK's most northerly distillery has been developing for years, with Blackwood Distillers developing a hugely successful range of spirit-based drinks using the appellation 'Shetland', based on the central notion of building a distillery in Shetland. The company, led by the formidable Caroline Whitfield, owns property and has an office in Catfirth, on Shetland's east Mainland. Initial plans to build a distillery there were put on hold when an employment crisis in the most northerly Shetland island, Unst, caused by the closure of RAF Saxa Vord, led local development bosses to approach Blackwood with the idea of moving the operation even further north. Since then, I understand that Blackwood have been very keen to forge ahead, but the new owners of the RAF property planned for conversion, Military Asset Management, have moved somewhat more slowly than local people and development agencies expected or wished. However, the former RAF motor transport depot should be transferred to Blackwood next month, according to The Shetland Times. There is whisky in Unst already, distilled for Blackwood by Inver House and maturing in oak casks at various secret locations. There soon will be a lot more, if Caroline has her way. The plan is to set up a bonded warehouse, and then develop the distillery, along with other interested parties who are planning a three star hotel, a hostel, holiday cottages and the relocation of the local Valhalla Brewery. I included my Belstaff suit with the BMW. It was an effort to finalise the transaction with biking, to deliver myself from it. Incidentally, I haven't heard anything from the guy who bought the bike. He should be pleased, as it was a bargain. I never make a profit selling anything on eBay, other than guitars, for which people appear to be willing to pay silly money. But here's a thing: My first motorised two-wheel machine was a scooter, a Vespa. And Vespa have this four-stroke 250 which will do 90 mph and...it keeps your legs dry. What a night! It was beautiful, mild and clear over Shetland; the lunar eclipse was simply stunning. Enjoyment was helped along by the superb meal provided by our friends Neil and Yvonna, not to mention a couple of glasses of Neil's excellent home brew. And then, at home, with astronomy student Magnus back from University, we got out the Talisker and the binoculars. Talisker under the stars: And after the Amrut and the Three Ships (see below) this was the real deal: Nigh on 46 per cent alcohol, 10 years old, and full of mountains, sea, salt and tangle. I sometimes think that whisky can only be enjoyed properly out of doors. Magnus was able to point the glasses (the optical lenses, that is) in the direction of otherwise invisible astral objects - a nebula here, a beehive cluster there. It was magical. And the Talisker helped. Undoubtedly. Ernest Shackleton's epic 1907 polar adventure, was whisky-fuelled. Mackinlay's provided the drams for the trip, and now some of the actual cratur involved has turned up, buried in the ice beneath Shackleton's expedition hut, unopened and in apparently perfect condition. What's the betting that a 'Shackleton's Dram' makes its appearance in due course? Perhaps a bit like that 'Whisky Galore' bottling of 20-odd years ago, when tiny amounts of salvaged 'Polly' were blended with other whiskies, bottled and sold (with very nice labels)at a huge premium. I remember consuming some, illicitly, straight from the bottle in an Oban bar during a Royal National Mod...but let's gloss over that, shall we? Mackinlay's is owned by Whyte and Mackay, which in turn is in the throes of transfer to Vijay Mallya (see below. There's a revealing piece in the Sunday Herald about Mr Mallya's future intentions. I don't like the sound of this dismissal of 'whimsical' interpretations of what 'whisky' actually is. If you're going to make a spirit out of molasses, surely it's rum and not, as is being insisted about some Indian products, a 'whisky' or 'whiskey'? Not that there's anything wrong with a tot of Trawler, Stewart's (Shetland-owned) or for that matter Havana Club in the right circumstances. I once had some home-made, herb-infused rum in a disreputable shack on the Caribbean island of Monserrat. It was served from an unlabelled bottle by a slightly confused guy with impressive dreads, and it was one of the smoothest alcoholic spirits I've ever tasted. Six months later, that part of Monserrat was destroyed by a volcanic eruption. I don't think the two events were connected. Last gasp of Morton the motorcyclist? Maybe. I arrived at BBC Radio Shetland to be admonished by Mike, who remains a consistent biker, for having yet again given up motorcycling 'for ever'. 'You need to make your mind up, Tom' he said. And of course he's right. I think I have, honestly. Perhaps. Coming down the road from Hillswick to Lerwick today on the BMW (very cold, but mainly dry) I was trying to stay alive, and there's the problem: As soon as you start motorcycling solely for survival, flinching at every pothole, every wobbly bend, it's time to head for pedal power or the protection of sheet metal and airbags: The margins in motorcycling are just too narrow. It's a youngster's game, really. And besides, I still can't get that Beemer onto its centre stand. So I consigned the bike to SBS for its trip south. I packed the panniers with tools, spares, documentation and my Belstaff rain suit. I kept the helmet and gloves, though. You never know. Then I walked away with just one backward glance. It looked good, the Blue Beast. In 1970, there was a Vespa 150 scooter, used for scaring dogwalkers in Fullerton Woods, Troon, and golfers on the Lochgreen course. The following year, I acquired a terrible old Raleigh moped for the same purposes. Finally, I took to the road in 1973 on a Honda 50. By the end of that summer, I'd passed my driving test and had a car, an old MG1100. No more bikes until 1987, in Shetland, a Honda CB125T. That lasted a year, and then nothing until 1992, and the Orange Beast of Spirit of Adventure fame - an MZETZ250 with Squire sidecar. Sold on telly to a man from Campbeltown. After that, let me see...1994, having at last passed my bike test, an old Kawasaki Z650, followed by yet another MZ ETZ250, this time without sidecar. Bought in Fort William and ridden, illegally, back to Cromarty in the middle of the night. Madness. A decrepit Honda Goldwing GL1100 (lovely to ride, kept breaking down, and my first BMW, a really nice R65LS. There was also a truly mental Yamaha RD400E, violently fast, allegedly the fastest air cooled two stroke ever made. For two wonderful years, there was a Triumph Tiger (the old one, an ex-police bike with Bonneville cylinder heads; leaked oil everywhere. And then my only new bike, an MuZ Skorpion 650 Sport. Lovely design, a great Yamaha engine, too wee. Moving swiftly along, there was a horrendous Jawa 350 two-stroke, in 2004 a Kawasaki GT1000 (very good, and cheap, tourer)then, in 2005, a Harley Davidson Sportster (worth owning, if only for the noise. But too wee for me, really. It looked, as one friend said, like a 125). Finally, the BMW, bought last October, and sold today. That's it. Sixteen motorbikes. Enough is enough! To the folding pushbike!